From Israel, Quiet Efforts Are Underway To Aid Civilians In Syria : Parallels The two countries have fought each other in the past and technically remain in a state of war. But both the Israeli military and private organizations are quietly delivering humanitarian aid. 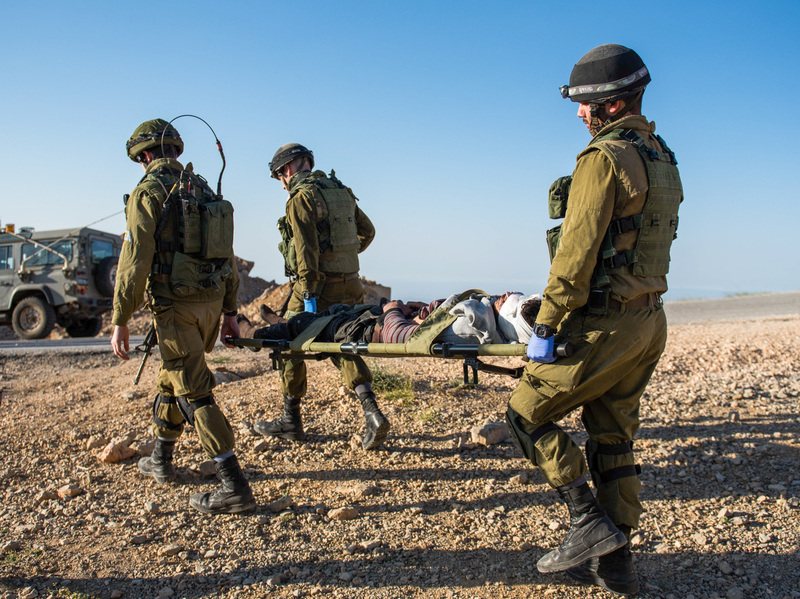 The Israeli army facilitates the transfer of wounded Syrians to Israeli hospitals. As the war rages in Syria, there have been efforts in Israel, its neighbor to the southwest, to lend a hand to Syrian civilians. The aid projects involve a mix of sympathy, secrecy, strategy — and sensitivity. Israeli volunteers recently gathered in a warehouse to prepare boxes of children's medicine to be sent to Syria — but the Israeli company that runs the warehouse asked not to be identified because it did not want to be publicly associated with the initiative, according to one volunteer. Israel and Syria have battled each other in the past, and are technically still at war. One Israeli volunteer standing among the crates of medicine, Yotvat Fireizen-Weil, said her family has struggled to accept her activism for Syrians. "My brothers are all military and security men. Protecting Israel is a very, very significant part of our family," Fireizen-Weil said. "It is not easy for them, what I'm doing. It's created a lot of conflict. At first, I think they didn't understand. Like, 'Are you crazy? These are our enemies.' "
Yotvat Fireizen-Weil, an Israeli volunteer, prepares boxes of children's medicines to be sent to Syria. She says her family sees Syria as the enemy and has found it hard to understand her activism on behalf of Syrians amid the Syrian civil war. Fireizen-Weil was moved by images of the human tragedy happening next door; she still cannot get out of her head the image she saw in the news of a Syrian father holding his twin babies, killed in a chemical attack, unable to let go. Late last year, she and other like-minded Israelis found each other on Facebook and organized prayer gatherings for Syria on the eve of the Jewish holy day of Yom Kippur. Then they started a grass-roots group and organized a fund drive for children's medical supplies. The group, called Just Beyond Our Border, has raised more than $500,000 from Israeli donors and U.S. Jewish organizations. Volunteer Zohar Kaplan says his grandmother, who started a new life in Israel after much of her family was wiped out in the Holocaust, was among the donors. "She said, 'You know, my family was refugee, our people were refugees. And it's amazing that we now have a country and can help other people who are suffering,'" Kaplan said. The medical supplies the volunteers were packing were later handed off to an Israeli nonprofit called Israeli Flying Aid, which says it delivered the supplies inside Syria. It's a rare Israeli organization that delivers aid to Arab countries off-limits to Israelis. Founder Gal Lusky said she and her group use a cover story and do not identify as Israelis in order to do their work safely. "The mission is delivering aid and not being identified," she said. Lusky founded the group in 2005 to provide aid after a tsunami struck Southeast Asia. Since then, the organization has focused on providing aid to civilians in places where Israel lacks diplomatic relations, like Syria, Iraq, Sudan and Indonesia. 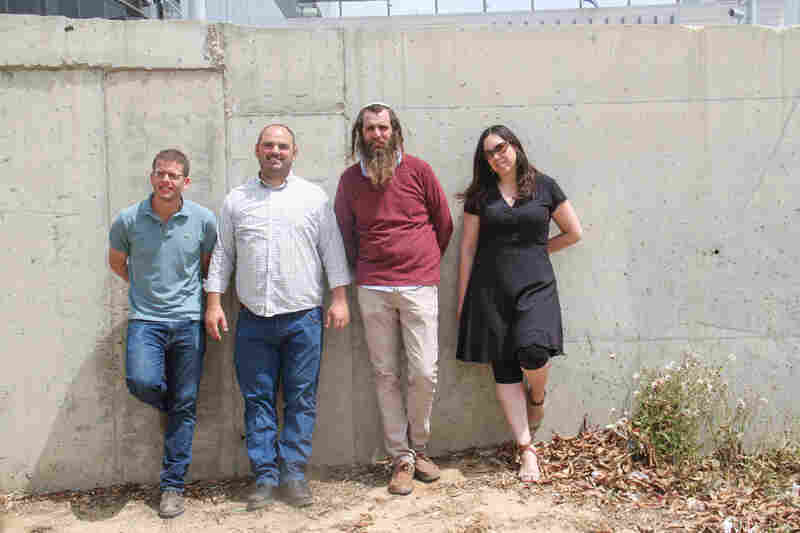 Israeli volunteers (left to right) Netanel Peled, Zohar Kaplan, Shivi Froman and Yotvat Fireizen-Weil with the group Just Beyond Our Borders have raised hundreds of thousands of dollars for aid to Syrian civilians. The Israeli government runs an official humanitarian relief program, called MASHAV, which since 1958 has offered assistance to more than 140 countries and authorities in Africa, Asia and Eastern Europe — assistance in agriculture, water management, emergency medicine and other areas. But it cannot officially access Arab and Muslim nations that do not share ties with Israel. Lusky is short on details about her group's work in Syria; she doesn't want her Syrian partners to be endangered by being found to work with the Israeli enemy — and she wants to protect herself as well. "I can't tell you much, and you can probably understand why," Lusky said. As for the children's medicine packages, "All the supplies entered nine different hospitals in Syria. We succeeded in doing that," Lusky said. There are other private Israeli aid efforts. Doctors and other volunteers have helped Syrian refugees in Greece. Israeli hospitals have treated more than 3,000 Syrians wounded in the war; Israeli troops rush them from the border to hospitals in northern Israel and return them to Syria when they are discharged. A government proposal to take in Syrian war orphans never progressed to action; the Israeli prime minister's office wouldn't say why. The Israeli army is also involved in aid efforts. It recently announced a new initiative it calls Operation Good Neighbor. For the past year, soldiers have been delivering food, supplies and fuel to Syrians on the border with the Golan Heights, which Israel captured from Syria in 1967. Troops have also brought some 600 Syrian children to Israeli hospitals — not for war wounds but for general medical treatment, since so many of Syria's doctors have fled since the war began. The military is also building a field hospital along the frontier to provide basic medical services to Syrians there. Military officials say they hope the efforts will humanize Israelis in the eyes of Syrians. Perhaps the military went public with its aid efforts also in order to try to improve the image of Israeli military, often perceived around the world as a brutal occupying force controlling the lives of Palestinians. In footage provided by the military, filmed with a night vision camera, soldiers are seen pumping fuel through a tube running through Israel's security fence into Syria. The border areas are controlled by a patchwork of Syrian rebel and regime forces, and Israel has exchanged fire with some. Udi Dekel, who used to direct the Israeli army's strategic planning, explained why the army helps Syrian civilians along the border area. "First of all, to be nice. There is a murder on the other side of the border," said Dekel, now the managing director of Israel's Institute for National Security Studies. "But there is another objective. The local communities, we told them, 'We are going to support you. But your mission is to convince those armed organizations, rebels and others in the Golan Heights, not to attack Israel.' That was the deal, and it works very well until now." For Israel, there's relative quiet along the border. And for the 200,000 Syrian civilians estimated to be living along the border, there's some help.